Globally there has never been a communication phenomenon quite like Facebook, so Facebook competitions for small businesses are an amazingly cost effective method to gain new customers and to rapidly raise your levels of awareness. Facebook’s audience is diverse and all-encompassing in terms of age, social demographics with seemingly never-ending growth in member numbers. So it is no wonder that marketing companies have been eager to utilise its huge potential from simple awareness through to full blown advertising and beyond. However it is social media that has most eagerly seized upon the strength of Facebook competitions in targeting new sales and customer growth. Setting a competition up couldn’t be simpler and as with any form of marketing the rules and guidelines are easy to find, and to stick to. However if you have devised an eye-catching, awesome offer within an engaging post then you really won’t need to ask people to do this as they will willing want to do it themselves as part of the Facebook culture. Similarly you must acknowledge that the promotion is no way sponsored, endorsed, administered or associated by Facebook as part of the post. Without wishing to over complicate your competition you are responsible for providing official rules and terms and conditions. Personally I would suggest using a landing page or the ‘Notes’ section on your Facebook business page. Do Facebook Competitions actually work? 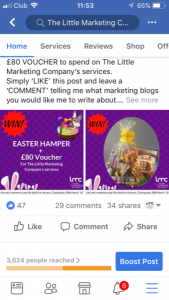 Personally I ran a Facebook Competition for my business last Easter with a prize of a hamper, the results were literally incredible! The competition went live just 2 weeks before Easter with the winner announced on Good Friday. Within this short timeframe my promotion reached 3624 people, received 29 comments, 47 likes and 34 shares! You have to agree that those figures are truly amazing there is absolutely no reason why your products and services cannot gain the same incredible boost. As part of my ongoing ethos at The Little Marketing Company I always like to give my support to help other small businesses raise their profiles by regularly taking part in business page competitions organised by people that I know – and I have recently won 2 competitions! One of the businesses I now do readily recommend to all my friends and the other one offered a prize for a course so good that I have also paid for a family member to accompany me. So you can easily see the power of someone winning your competition. Although the main goal is to raise awareness both entrants and winners alike will then use your services. When satisfied with the experience they will happily recommend your business. So gaining new customers along with the all-important repeat business! What happens if I break the Facebook competition rules? As mentioned I would always recommend that you take a moment to review the latest Facebook rules as many businesses have unintentionally ended up losing their business page by simply not realising that the goalposts have moved that day! Although the rules still allow a huge flexibility in scope I would definitely consider a Facebook competition tied in with the same promotion running alongside on your own website or business blog. That way you have greater control and complete freedom of creativity. As I have already mentioned designing an optimised landing page covers many bases plus the added benefits of driving increased traffic to your web site. This aids both data capture and elevated conversion goals. This new platform can also be accessed by your other forms of social media such as Twitter and Instagram, further extending your exposure and levels of customer awareness! The Little Marketing Company was launched specifically to work hand in hand with small businesses that don’t have the time or the resources to achieve all of their marketing goals. So if you need any further advice or help in setting up your first Facebook competition then I am always on hand to steer you in the right direction.